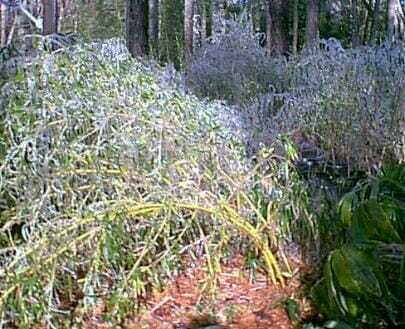 Our cold hardy bamboo does a great job of handling show and ice. Our bamboo is growing all across the country in all 48 continental states. We are located in Alabama and rarely see much ice, let alone snow. On the rare occasion we do it’s exciting for us and we love to take pictures to share. On this day our nursery saw the earliest snow we have experienced in 54 years. Those in northern states do not understand the joy snow brings to the south, it’s such a rare sight that we rarely get to experience. Groves with less distance between canes tend to accumulate more snow on top of the foliage, causing them to lean. You can see with the Moso/Vivax grove the snow reaches the ground and the canes stay straight. On our thicker Giant Gray (Henon) grove, there was barely any snow on the ground floor! 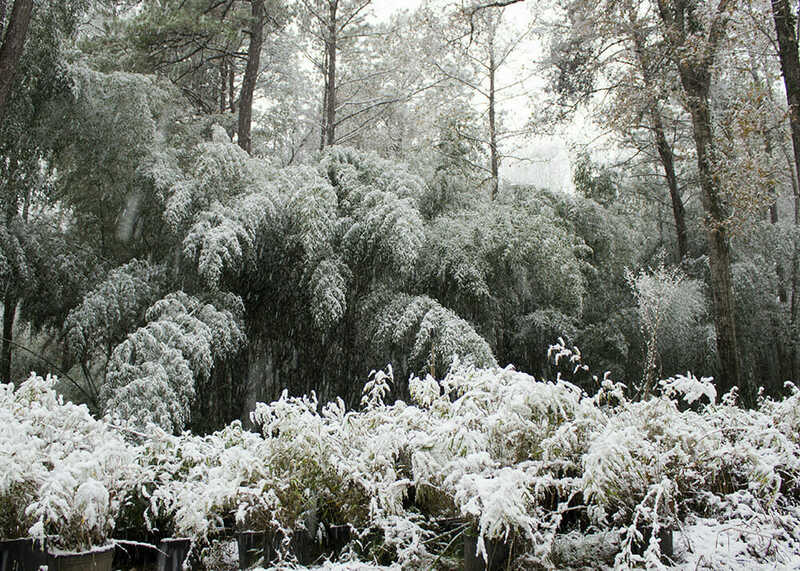 Cold hardy bamboos typically stay evergreen even through these rough conditions. This shows how versatile bamboo can be in any climate and landscape! 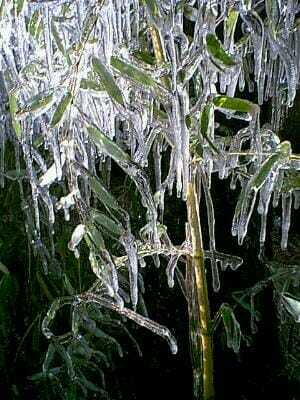 Several years ago we took some very cool pictures of bamboo after an ice storm. The photo resolutions are not quite up to today’s standards but they are still awesome! Always allow mother nature to melt the snow and ice. 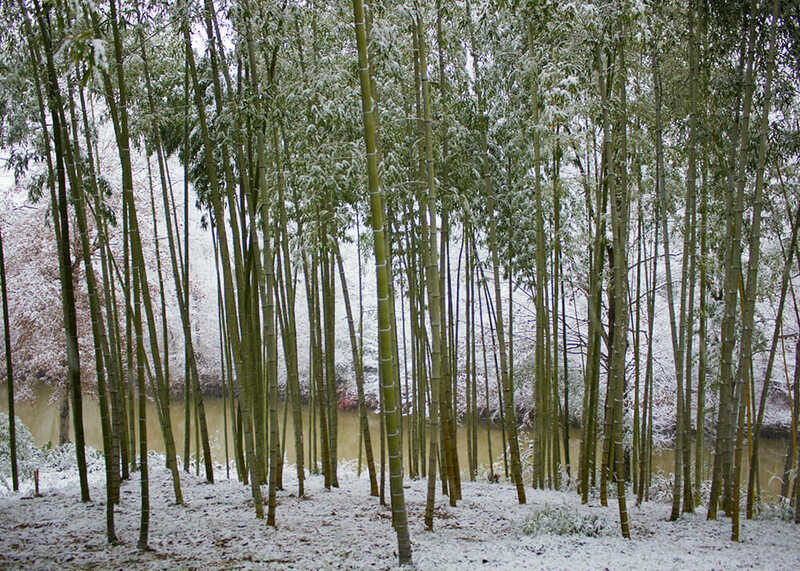 As it melts away the bamboo, in most cases without aid, it will spring back to its original up right position. Throughout our website we will try to pass our love of bamboo on. In doing this we all will make our world a better place for generations to come. When a gardener purchases bamboo from us, we try to tell them everything to expect with their new plants. 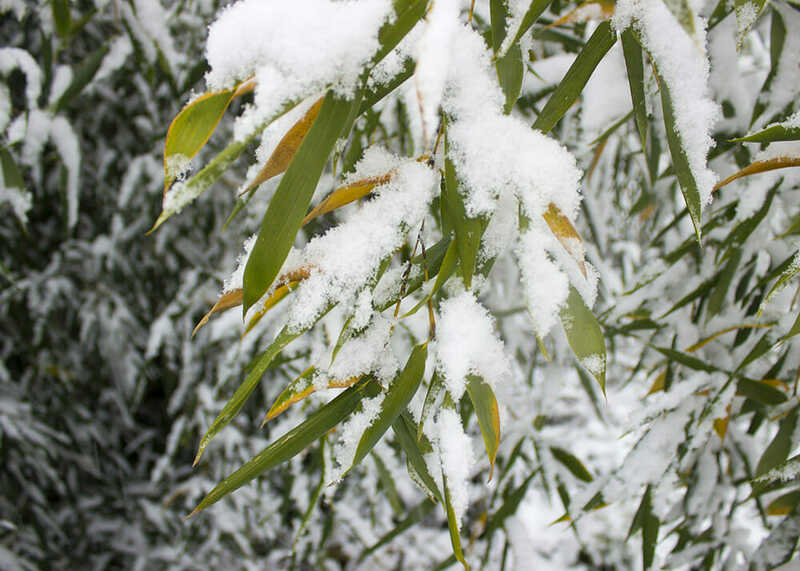 While it may look like it is hurting the bamboo, this coating will act as an insulation and protect it from wind damage which can cause defoliation of the culms. 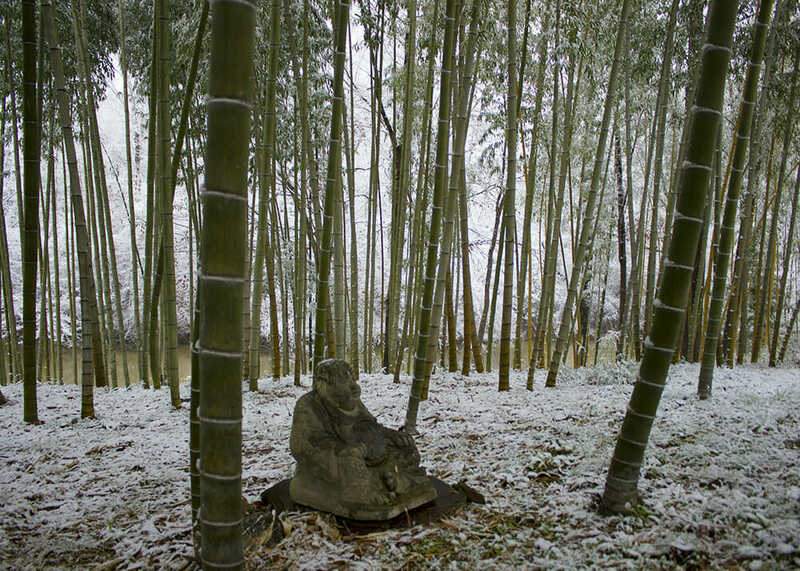 The ice and snow is a gradual build- up with the bamboo slowly bending to the weight. Always allow it to melt and return to its original position. Always leave the ice and snow on your bamboo. Never try to shake the bamboo to remove ice and snow build up. 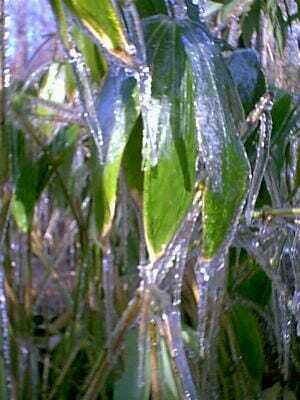 This action causes a break in the ice at the leaf stem. 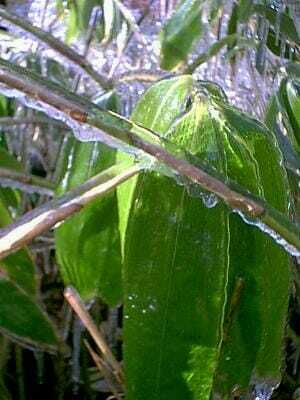 When this happens, the weight of the ice on the leaf is too much for the now ice free stem to support. In turn, causing the leaves to fall to the ground. If the shaking action is severe the entire culm ( cane ) will snap like breaking a pencil. You can see the ice melting away here and the bamboo will be just as before. This page and many others will help you to understand this marvelous plant. Please take time to read Growing Habits where you will find valuable information on how the bamboo will grow and provide your environment with lush foliage for privacy plus a natural habitat for birds. Find the right bamboo in your climate with our Bamboo Finder, just enter your zip code and search! Yep bamboo is amazingly resilient and I can attest the cold hardy species do just fine in ice and snow! I’ve seen it virtually flat to the ground here in Ohio under snow loads, only to pop right back into shape after the thaw. Americans growing bamboo- love it! Hello. I hope you can help me or at least point me in a direction – I live in coastal North Carolina – this winter we had a 2 week stretch that saw temps in the 20s & teens – sustained for the maybe 10 days. I have a heavy mulch layer around my clumping bamboo but it took it really hard – the main plants are established but I saw every leaf brown and then drop. The culms turned black for the most part – I am seeing a little greening of the culms near the bottoms. I am also seeing new small shoots starting from the ground. What do you think I should do with the leafless culms? How long should I wait to see if I am going to get any bounce back? Any help is appreciated. put on new foliage. If they turn brown it will be best to cut them out. I would wait until after spring and then evaluate which canes need to be removed. Your doing the planet good. Your an amazing human being, and an example for our vast ever growing population. Keep it up, and keep spreading that good bamboo word!!! Your Mother Earth greatly needs and appritiates what you do.